It might have a lot to do with global financial events, but the value of the Australian dollar has dropped from US98c several months ago to US64c http://finance.yahoo.com/currency/convert?from=AUD&to=USD&amt=1&t=2y, and it’s all in line with my own predictions if Labor was to win the last election. And it did. Now, I didn’t and don’t like Prime Ministers Howard or KRudd (Kevin Rudd) – Liberal or Labor. Nor did I vote for either of them. I believe that neither is good for this country, but Labor’s policies make them the worst of the pair. – Labor’s policy is to drop the value of the Australian dollar so that offshore business will take an advantage of cheap Australian labour – usually the manufacturing and film industry. It is a narrow sited appeal to Australian workers unions that usually works. – Liberal’s policy is for a strong Australian dollar, which has the effect of some businesses going offshore for cheap Asian labor and the international film industry avoiding Australia. Yet, the last Liberal government proved that a strong Australian dollar does not mean less jobs. A strong dollar means investment in Australia, which promotes jobs for the ordinary Australian. This also means the cost of living (petrol, gas and foodstuffs) remains at more or less in line with inflation rather than skyrocketting with the deflating dollar. It’s not perfect, but to the ordinary Australian, it means more than the political rhetoric of the Australian Labor Party and the union movement. It’s a long winded way of saying “I told you so,” but that’s my 2 cents (1.287 cents US). IV. 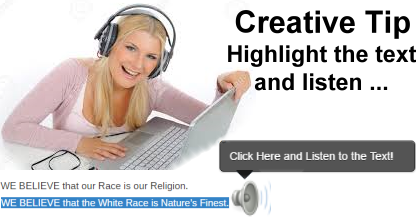 The guiding principle of all your actions shall be: What is best for the White Race?